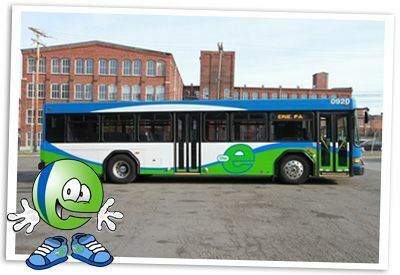 The majority of student transportation is provided by the Erie Metropolitan Transit Authority. The district also provides yellow school bus service as required by law for Special Education students when a student's IEP requires. 2018-19 bus schedules are now available by clicking the link to the left of this page. Please note that these schedules are subject to change, and parents will be notified of changes. Updated schedules will also be posted on this page. What is the district's current transportation radius? The district will provide bus passes for use to and from school for elementary and middle school (K-8) pupils residing in the City of Erie and live one and a half (1.5) miles or more from the school in which the pupils are enrolled. The district will provide bus passes for use to and from school for high school students who reside in the City of Erie and live two (2) miles or more from the school. Why does the district contract with EMTA for transportation instead of providing yellow bus service for students? Erie's Public Schools has been contracting with EMTA for many years to provide bus service to students because the district receives a higher rate of reimbursement from the Commonwealth of PA for this type of contracted service. Each year, EMTA works with the district to develop routes that meet student transportation needs to and from school. How do I get a bus pass if my child is eligible? If your student received a bus pass last year and has not moved or changed schools, a new pass has automatically been printed for them and can be picked up in their school office. If a pass has not been printed or if your student has moved/changed schools, please update your information with the School Secretary and complete a bus pass application. Applications can also be downloaded here and turned in to the school office. EMTA will not allow students to ride the bus without an official bus pass after September 10, 2018. May the school district suspend busing services for a child? Yes. Transportation is a privilege, not a right. Are school districts required to transport students? No. Pennsylvania law does not require a school district to provide transportation for its students. As a convenience to district families, the Erie School District chooses to provide transportation for students that live outside of a school's immediate area. Must transportation be provided for special education students? Transportation must be provided as required by a child’s individualized education program (IEP). How can I reach the transportation department? You may reach the EPS Transportation Department at 814-874-6900. You can also call EMTA regarding routes and school "tripper" buses at 814-452-3515, or at 452-2801 using extensions 113 (Melissa Klie) or 107 (Ed Torres).